There is something exciting about getting a big tower of gourmet treats. Our incredible gourmet cookies and BIG chocolate brownies are a terrific combination. They're made by hand, with simple ingredients, chosen for their uncompromising quality. We use 100% organic whole wheat pastry flour, AA grade butter, farm fresh eggs, pure cane sugar and real dark French chocolate. No additives, preservatives, extenders or other such nonsense in these incredibly delicious homemade treats. Just add milk, make some friends and enjoy! Package contents: (24) cookies (8) BIG Chocolate brownies This gift box is made from 100% recycled materials. These cookies and brownies are the best! 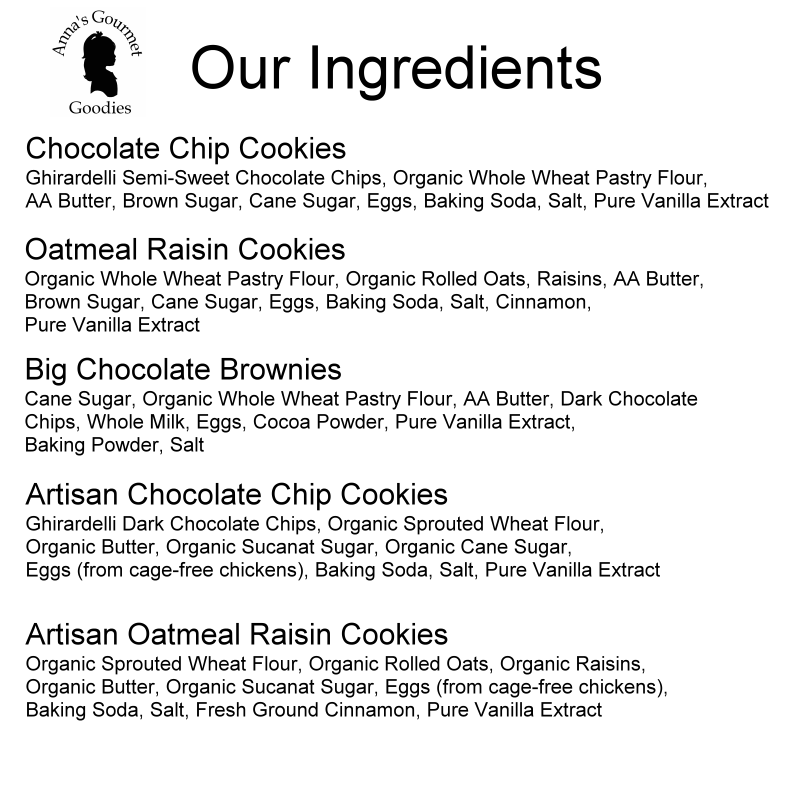 The Oatmeal Raisin and Chocolate Chip cookies are delicious, and even better warmed up in the oven! The brownies are so moist and chocolatey! Having individually wrapped packages makes it easy to share too! We will recommend Anna's to all our family and friends! Great customer service as well! Received as gift but were so delicious had to order more!!! The entire adult family loved them. Highly recommend. In looking at the website, I was in a hurry and did not read. I originally thought the location was Charlotte and there was next day delivery. I ordered late so wanted a fast delivery. While the gift did not arrive on the exact day I wanted it was a fast delivery. My niece was thrilled with the cookies and brownies and immediately displayed them for all to see and share. My thanks go to the company for making a little drama queen very happy. I sent this package to my parents as a thank you for putting me up for the week and they loved, loved, LOVED the goodies. The first night they split one of the scrumptous brownies and made a hot fudge brownie sundae and called me long distance to share that they were loving the thank you gift. Thanks for the speedy deliver and the delicious treats! I ordered the brownie and cookie mix basket for my son's birhtday. I received a call from him once the package was delivered raving about the brownies -- did not even last a day. Note to self, I need to order the larger size for the boys. I will definetly recommend Annie's Gourmet Cookie's.